Contact Ogun Today. OgunToday is a local news portal. It is the go-to place for up to date news on Ogun State, Nigerian and the world. We serve our readers all over the world informative, educative and entertaining news stories every hour. Our news stories cover all sphere of life: politics, sports, business, economy, law, health, show business, life itself, arts and culture, technology, science, environment, real estate and all. Have a leak, a news story of info you think everyone should know about? Contact us. We keep our news sources confidential at all times. We wish to ask a small favor of you. Asking people to pay (i.e subscription service) to read Ogun Today online will not work presently as you may be aware. And, advertising revenues across the media are falling fast. So you can see why we need to ask for your support. The Ogun Today’s independent, investigative journalism takes a lot of time, money and hard work to produce. But we do it because we believe our perspective matters – because it might as well be your perspective, too. If everyone who reads our reporting, who likes it, helps to pay for it, the future would be much more secure for Ogun Today. Make a donation today! Let’s Publish You! 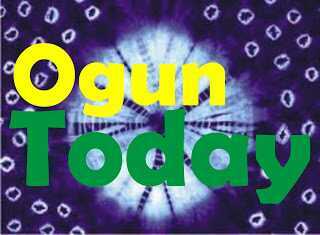 Write for Ogun Today. Like to write? Then write for us! We’ll give you free data every month and other goodies, if you are able to write two or more publishable articles each month. Read the guidelines about publishing your articles on Ogun Today here. Contact Ogun Today for your adverts. If your target audience is the over four million Ogun State inhabitants this is the platform to reach them all effectively wherever they may be at the least cost. Come let’s talk advert! You will be surprised our rates are these low! The No.1 go-to place for latest news from Ogun State. Ogun Today’s focus is on Ogun State and her citizens. We’re committed to reporting fairly and providing true information about the state, her people, her environment, Nigeria and the World for the benefit of all. Reach over FOUR MILLION Ogun target audience with your ad and campaign messages today. See advert rates.